As a complete and utter makeup addict I thought I’d share some of my top tips for applying foundation with a brush. For me, foundation is all about achieving a natural look – whilst foundation is meant to cover imperfections, it isn’t meant to hide your skin completely, which is why I love applying foundation with a brush. The brush used in this instance is the pointed buffing brush, which is perfect for buffing in foundation completely including the under eye area and the nose. 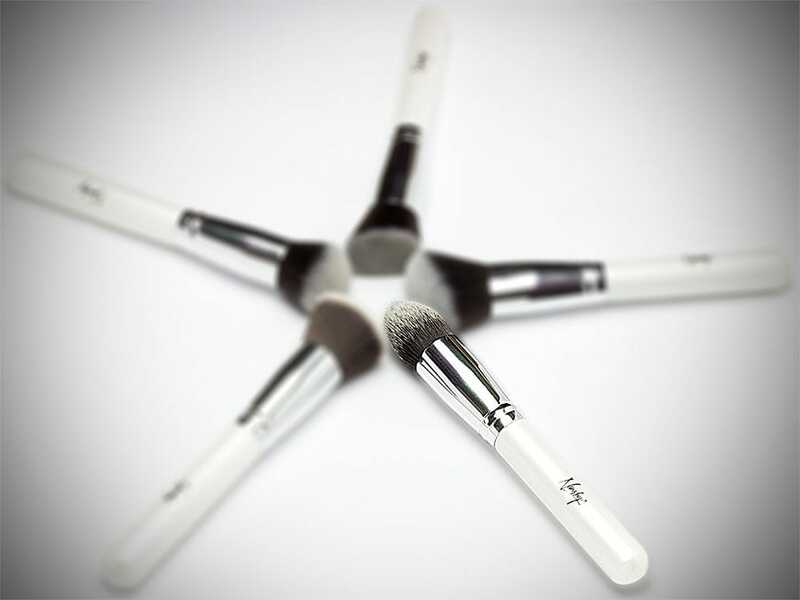 The tapered shape of the brush allows you to fully buff the foundation into all areas of the face providing an even coverage. When it comes to foundation, less is more so it’s best to start with a small amount and then build it to a coverage you feel comfortable with. I use this brush daily with either a full coverage foundation when I need to hide my imperfections quickly and easily or with a CC cream for lighter coverage – it works lovely for both. With it’s easy to hold handle, dense bristles and super soft hairs it allows the foundation to really sink into the skin without appearing to build up into a visible layer. So how do I achieve a flawless base with brushes? Firstly I like to start by applying the amount of foundation I need to my hand, this makes sure that I don’t use too much! I usually use one to two pumps of foundation depending on the formula, but you can always add more or less to suit you. Next I tend to use my fingers to dot the foundation onto the areas of my skin, usually the nose, cheeks forehead and chin with one dot each. This helps to evenly spread the foundation to begin with, ensuring all areas that need coverage are covered. To begin with I work from the centre of the face (the nose) and take the foundation outwards, this helps to give an even finish and allows you to work the product right the way to your hairline and down to the neck to make sure you have an even coverage and no visible lines. The fourth and final step is to work on blending the product into your skin, this helps it to last longer and look more natural. I love that applying my makeup with a buffing foundation brush allows for a smooth and even coverage that really lasts on the skin. I find coverage to be fuller using a brush yet not at all overpowering. My second favourite brush to apply my foundation with is the round top buffing brush. Is this how you do it? 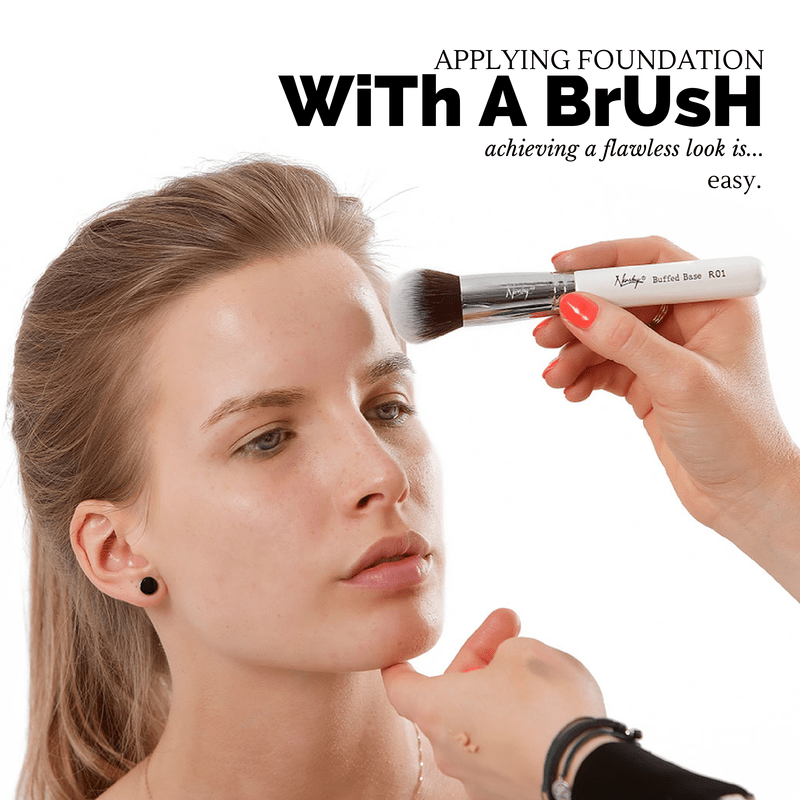 Have you got different way of applying foundation with a brush? Share your comments and ideas below.